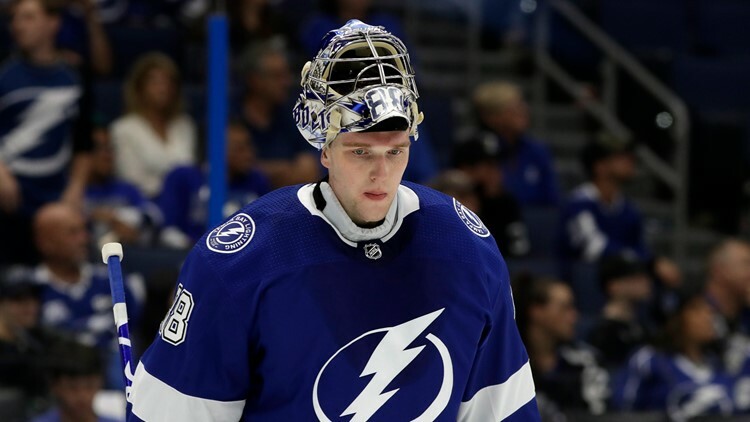 Tampa Bay Lightning goaltender Andrei Vasilevskiy skates around after giving up a goal to the Columbus Blue Jackets during the third period of Game 2 of an NHL Eastern Conference first-round hockey playoff series Friday, April 12, 2019, in Tampa, Fla. The Tampa Bay Lightning saw a 3-1 loss on Sunday night. COLUMBUS, Ohio — The Tampa Bay Lightning look to find some way to keep their playoff hopes alive. The Lightning lost again to the Blue Jackets -- a 3-1 loss in the first round of the NHL playoffs. It's been a rocky start for the Lightning having lost their first two playoff games at home. Making matters worse, the team didn't have their top scorer Nikita Kucherov for Game 3. The forward missed Sunday night's game for boarding Blue Jackets defenseman Markus Nutivaara in Game 2. The Lightning also announced defenseman Cameron Gaunce has been recalled from the Syracuse Crunch. Coming back from a 0-3 hole has only been done four times in NHL history. The Lightning play the Blue Jackets again at 7 p.m. Tuesday.